President David Granger on Wednesday recognised the Ms Renaissance Pageant as one that exemplifies not only womanhood but the sanctity of motherhood, individuality, and the achievements of women. The Head of State made these remarks during a courtesy call by the contestants of the Ms Renaissance 2017 Pageant at State House. The Head of State said that given the level of interpersonal violence in the country, the Pageant reinforced the need for women to be more respected in society. “I do hope that pageants like this one could help to restore respect among our people, and it has to start in our homes. It starts with the boys; they must learn to respect women and that starts with respecting their mothers. 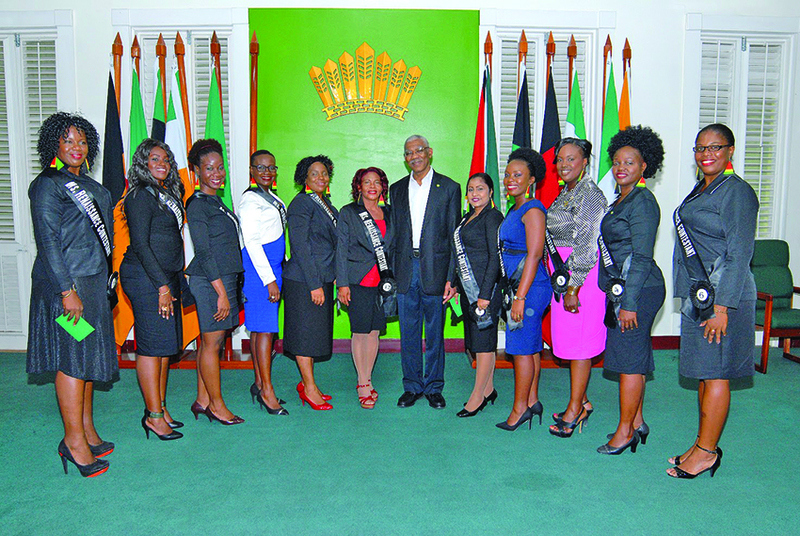 [The pageant] also offers a lesson for young boys when they see women, mature, responsible and beautiful, appearing before them not just as objects of lust or flesh, but as symbols of maturity and what we stand for in Guyana,” President Granger is quoted as saying in a release from the Ministry of the Presidency. The President said that too many people today resorted to violence easily. Hence, he is hopeful that a pageant such as the Ms Renaissance would serve as a positive reinforcement that women should be valued. Pageant Coordinator Negla Brandis expressed gratitude to the President for accommodating the contestants and offering words of encouragement and advice. A token of appreciation was presented to President Granger, who also presented tokens of his own to the contestants. The Ms Renaissance 2017 Pageant will be held at the National Cultural Centre on August 19. It caters to women, who are 30 years and older. The Pageant is in its eighth year and is held bi-annually.